I think of the family room as more relaxed and more personal than the living room. So if you’re lucky enough to have this extra room in your house, why not take the opportunity to show off art or artifacts that tell some of your personal story? Copyright © 2015. Photograph by Sarah Hebenstreit with stylist Gabrielle Blair. 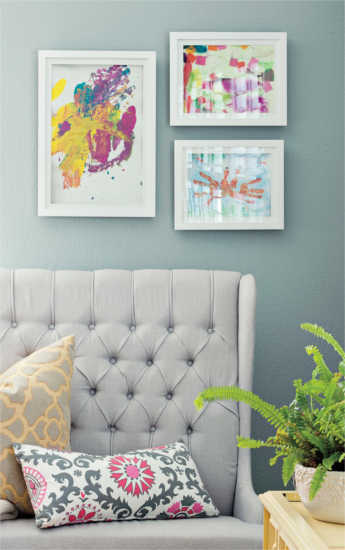 Wall art in the family room is a chance to make your priorities and family values readily apparent. You adore your kids (of course! ), you love road trips, and you’re obsessed with the young Elvis. With a glance at the walls of your family room, I can see all that about you in an instant, and whatever else you want me to know as well. Create a family room gallery that means something to everyone in the family, and it will keep some of your happiest memories at the ready. Gabrielle Blair, designer and mother of six, embraces the current widespread love of design, and approaches motherhood from a designer’s perspective — writing posts like tips for great family photos, her favorite parenting trick, thoughts on selfies, and forty things she loves about her husband. In addition to Design Mom, Gabrielle’s active internet career also includes being a founder of Alt Summit, and a creator of Olive Us. Married to Ben Blair, they live with their six kids — Ralph, Maude, Olive, Oscar, Betty and Flora June — in the French countryside, in a farmhouse with a name instead of an address. The Design Mom is filled with tips and strategies for making your home beautiful, comfortable, functional and kid-friendly — a place where both you and your kids will thrive.